Rebecca Disini graduated with a Grand Diplôme in 2016. Having successfully completed the Cuisine Diploma in London in 2001, Rebecca decided to continue her adventure in Paris with the Pastry Diploma. Her studies at Le Cordon Bleu have given her the opportunity to live in 7 different countries. 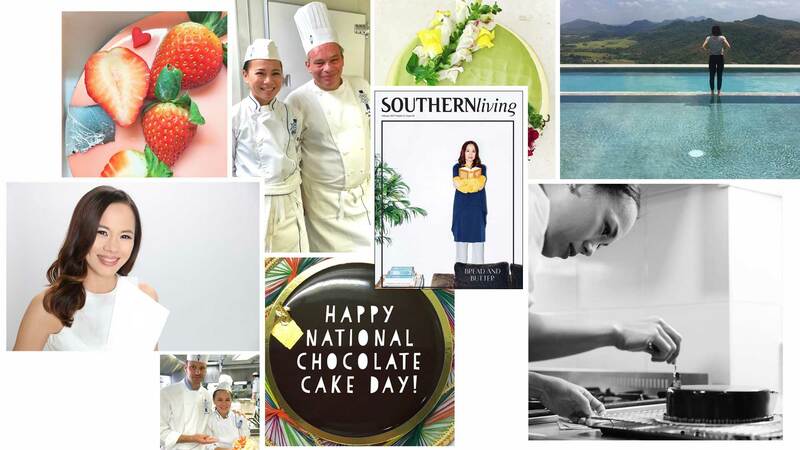 Today, Rebecca runs her own pâtisserie called “Ooh la la!” and is also a Culinary Strategist for Monde Nissin. Food and art was a natural path for me to endeavour having been surrounded by fresh produce from my grandparent’s farms and my mother's love of anything and everything beautiful. I have always imagined cuisine to be an expression of one's self and that it was the most natural canvas for me to express my artistry. I never imagined that we would be whisking eggs manually until Superior level, the kitchen mixers relegated only for the instructors, day in day out. This taught me that doing everything manually is still best practice because in pastry, there are no shortcuts. There were times when I could no longer beat the egg whites to stiff consistency, having had major hand surgery a decade ago, but I endured. The chefs would tell me in French "keep going, keep going..." and I would. No eggs were wasted, I survived, and everything under a day's work. There is nothing like seeing your hard work turn into the tastiest macarons. After Le Cordon Bleu London, I worked as a chef for The British High Commission in Singapore. I cooked for dignitaries and politicians - one of the most frequent visitors was the late Lee Kwan Yew, the first Prime Minister of Singapore. I then worked for Unilever Foodsolutions as their Regional chef handling Asia, Africa, and the Middle East creating benchmark products for brands like Calve, Knorr, Walls, Carte d'Or, Best Foods, and Lipton while based in Malaysia. After that role, I moved to Thailand to become the Innovation chef for Newly Weds Foods Asia-Pacific, the world leader in seasonings and coating mixes, making products for the UK, EU, North America, and Asia (supermarkets like Waitrose, Sainsbury's, Whole Foods, etc.). After completion of my Grand Diplome in Paris, I now am the Culinary Strategist for Monde Nissin working on the Asian execution of the world's meat-free alternative, Quorn. I also started my own pastry business called Ooh la la! by Rebecca Disini. Preparation, anticipation, and execution are words that you must live by every single day of your life. Choosing to become a cuisine chef and/or a pastry chef requires a lot of dedication, passion, and precision. There will be many trials and setbacks because not so many people understand the kind of commitment it takes for us to do our craft - perfection on daily basis is followed by beating your best effort. I am currently based in Manila, Philippines. My studies at the Le Cordon Bleu have made me live in 7 countries in almost 2 decades and I feel it is time for me to return to my roots, make an impact in healthy eating, and delight the senses of those who try my pastries. I have always loved French pastries and would like to see more of this here in the Philippines. Making an impact in the lives of people across Asia is one of my current goals. Working on Quorn and it's rollout in Asia will help me spread the gospel on healthy alternatives. I wear many hats, so on the the pastry side, I envision expanding my business so that I can see more of my entremets.